As a lifelong canvas artist, when I was given the opportunity to learn to "paint with glass" I jumped on it! I have always been fascinated with the way colors change and dance as light comes through glass, and taking lessons seemed the ideal way to incorporate my love of color and detail into another art form. All of my work, with the rare exceptions of my earliest pieces, is original, and, until I discovered Glass Eye 2000, was done with pencil, paper and lots of erasers! As any artist knows, watching an idea take form on paper is incredibly fulfilling. Watching your idea come to life in glass is quite simply one of life's greatest joys. Since I have started using Glass Eye 2000, I have had a whole new vista opened to my talents: no more brushing away eraser "nubs" — all I have to do is move a line! I have done patterns of animals, people, landscapes, boats... the possibilities are endless! In Glass Eye 2000 you are limited only by your imagination. Having been a canvas artist, I love to use individual bits of glass for shading and shadowing, especially in my animal and "people" panels, and absolutely LOVE all the tiny intricate pieces involved. With Glass Eye 2000, you can see exactly what those pieces are going to look like, and how each piece will work with the one next to it. If the pieces are going to be too difficult to cut, or might be prone to break, you can adjust the pattern before you print. This Design of the Month panel was originally designed as surprise 87th birthday present for my mother. 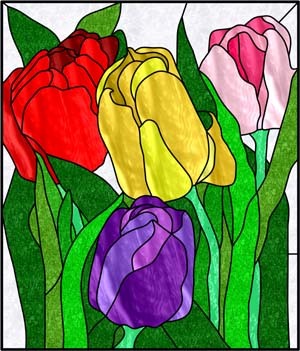 The pattern was based on a photo of tulips in my flower bed, with some "artistic license" taken with the placement and colors. She loved tulips but could not grow them — we all laughed and said she could kill a tulip just by looking at it. She took a bad fall in July 2005, and I spent the next five months away from my home, and away from glass, taking care of her before she passed away at the end of December 2005. She saw the pattern I had designed and said that she was going to grow tulips in heaven even if she couldn't grow them on earth. The panel is done completely in copper foil and is framed to match the double-hung window framing in the house. This panel was very difficult to complete because I no longer had my mother to give it to, and because it made me sad to look at the pattern after I returned home. However, after finding the perfect glass for all of the blooms, I realized that this panel WANTED to be finished and have the light dance through it everyday. The size of the panel had to be altered due to the differences in the size of the original pattern and the size of my dining room's east window, where it now resides. Neither the final size nor any design issues necessitated any reinforcement additions. After the piece was soldered, I applied black patina and then cleaned and polished it. I used the "belt and suspenders" theory, and framed it in ½" zinc before placing it in a custom wood frame nestled inside the lower half of the dining room window. The panel is in a direct line from our home's front entry, and provides a glorious display of color at sunrise, with reds, purples, yellows, pinks, and "40 shades of green" (this is, after all, an Irish household!) dancing across the dining room walls and the living room floor. Everyone who visits my home comments on how beautiful and lifelike the tulips are. I really believe that my Mom has put her seal of approval on these heavenly tulips. 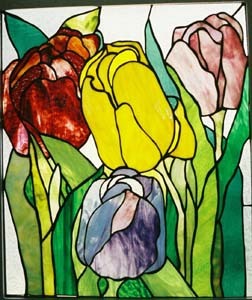 Tillie Smith O'Kelley took her first stained glass class in 2004. For the following four weeks, she lived, breathed, and dreamed in colored, textured glass and has never looked back. Tillie still paints, but now she paints with glass in addition to canvas work. Her first original design earned the Glastar Panel of the Month award for March 2005. Tillie has enjoyed success as a pattern designer and also as a stained glass instructor at the same university where she first picked up a glass cutter. She and her husband live in north central Louisiana. You may contact Tillie via email.